Lierna, Lake Como, apartment in residence directly on the lake, with outdoor pool, games room, sauna, indoor pool / jacuzzi. The apartment for sale is located on the beautiful beach of Punta di Grumo where there are also garages and private parking, as well as beautiful gardens and a Solarium area. A public car park and an excellent restaurant are just a few steps away. The center of the village is about 1.5 km as well as the train station, bank pharmacy, shops, supermarket, other restaurants and the pier for boats. Varenna is about 5 km away. The apartment has been completely renovated at the end of 2015 the plumbing, electrical systems and windows have been redone, a very modern air-conditioning system has been installed, which cools the different rooms through invisible and completely silent grids, individually adjustable . An anti-intrusion and anti-theft system of the highest level has been installed. Mosquito nets and curtains for each window were created, and an electric awning with a wind sensor was installed on the balcony of the living room (which overlooks the beach). entrance with security door , large living room, dining area, fully functional fireplace, kitchen furnished with white lacquered kitchen composed right (2 meters) sink, induction stove and oven Ariston, hood connected to the outside, left (2 meters) fridge and freezer Ariston . The living room has a large balcony directly on the beach and the kitchen has a beautiful window. the bedroom has a window on the condominium garden, the master bedroom has a communal garden terrace, a large white lacquered wardrobe with sliding doors. The bathroom has all the suspended sanitary ware and a tub with shower tray and glass for shower, as well as a beautiful window with a view of the garden and Bellagio. The floor in the entire house, even in the bathroom, is of fine Italian 17 mm natural oak parquet with large slabs, all the lighting with spotlights, chandeliers and wall lamps are of the highest standard and of prestigious brands, a another important feature is that the modern boiler is located in an invisible niche on the balcony. Lake Como, Como, attic a few steps from the lake and the center, in an absolutely exclusive position. Entrance, living room, lounge, kitchen, 2 bedrooms, bathroom, large terrace (30 sqm) and beautiful solarium (107 sqm). Double garage in width, cellar. 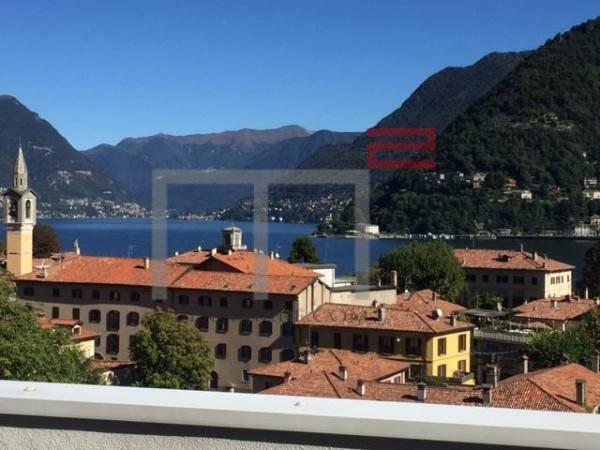 Lake Como, Carate, incredible and prestigious penthouse in modern complex of a few units. Large living room with bright windows, modern and functional kitchen, 3 large bedrooms, 4 bathrooms. All rooms have access to an incredible terrace (160 sqm) with Jacuzzi. Furnished. Lift. Garage for 4 cars. Unparalleled lake view! in the attic floor there is a large bedroom with a beautiful wooden ceiling, overlooking the lake, and another small room suitable for guests. From the apartment to the city center leads a footpath, a distance of about 800 meters, a leisurely walk takes about 15 minutes. There is a beach, a tourist port, a promenade along the lake. Nearby is the ski resort of Piani di Bobbio https://www.pianidibobbio.com/ (27 km). Ideal for holidays on the lake! Lake Como, Tremezzina, apartment in residence with swimming pool fully furnished. Ground floor: living room, kitchenette, bathroom with shower, double bedroom. Porch and small private garden. Basement: 2 large bedrooms, bathroom with bathtub. Garage, parking for guests, swimming pool.